Mark Hertzberg in front of the SC Johnson Research Tower. Mark Hertzberg is the author and photographer of Wright in Racine (Pomegranate, 2004), Frank Lloyd Wright’s Hardy House (Pomegranate, 2006) and Frank Lloyd Wright’s SC Johnson Research Tower (Pomegranate, 2010). He has lectured extensively about Wright’s work in Racine. Hertzberg also serves on the board of the Frank Lloyd Wright ® Wisconsin Tourism Heritage Program (“Wright in Wisconsin”). 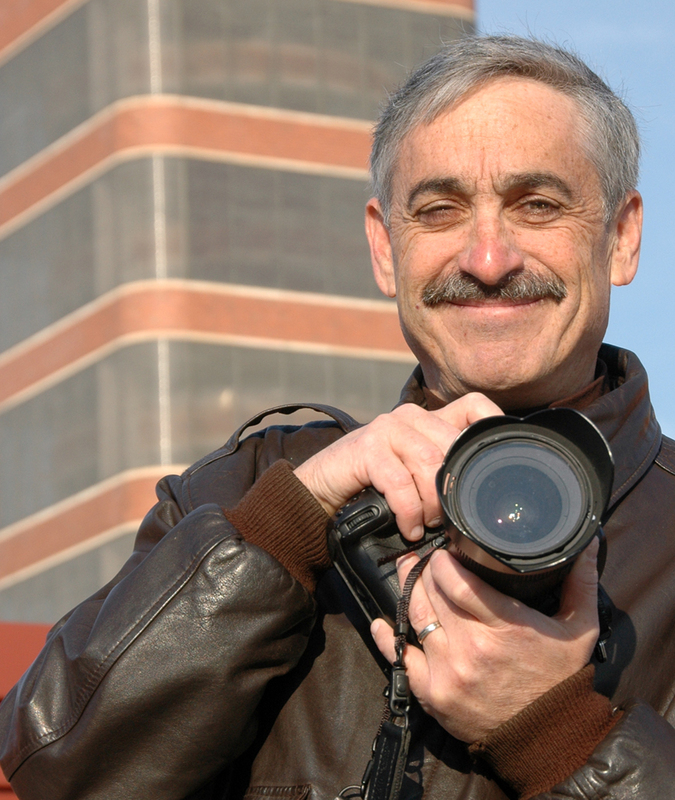 Hertzberg, the retired Director of Photography of The Journal Times in Racine, won numerous awards for his work. Beautiful work, Mark. Thank you for creating & maintaining this page. Great work! Btw, do you know where I might be able to find the floor plan up to scale for the T. P. Hardy House? I’m an Architecture major, and I need it for a project. I would greatly appreciate any type on info that you could provide me with. The drawings are now in the Foundation archives at the Avery Library at Columbia University. I do not know their access policy. Some of the plans might be in the Monograph. I do not have a copy so I cannot tell you for certain. Do you have any contact information for the stucco contractor who worked on the Hardy House? Thank you. Mason City Architectural Interpretive Center, 520 1st Street NE, Mason City, IOWA. Space is limited. RSVP: info@wrightonthepark.org 1.0 CEU for AIA members. I am not sure whether it will be open by them, or not. I will pass your note along. I learned about “wrightinracine” from Bicycle Times magazine. I immediately went to “wrightinracine” hoping to see maps of bicycle tours of Racine that showcase the Wright sites. Does such info exist? I am glad you read that column. There is no formal bike tour. The four sites are fairly spread out, except for the Hardy House and SCJ, which are blocks apart. I can bike it with you. It’s hit and miss about getting into Wingspread. You need reservations to tour SCJ, although you can see the buildings from the street. Mark – I am not sure how to email you directly from this site. My colleague and I are visiting The research Tower I a few weeks. I wanted to discuss with you any other Wright opportunities we would have while we’re in town for a Saturday and Sunday? Will reply later this weekend. This is inopportune time for me to write. Wingspread (the Johnson Foundation) is hit-and-miss for self-guided tours, depending on whether or not there is a conference going on. I am not sure of weekend availability. Call first. You can drive by the Hardy House, about five blocks east of SC Johnson. You can also drive by the Keland House but do not go down the driveway. The garage and the street side of the house are from Jack Howe’s 1961 addition. The garage is connected by a roofline to the former carport, to the right of it. Howe converted the carport (and did the garage) in 1961 as the family grew. There is also an additional room that was added then to the right of the room fashioned from the carport, at the corner of the house. Try to get to Milwaukee to see our (Frank Lloyd Wright Wisconsin: http://www.wrightinwisconsin.org) Burnham Street American System-Built homes. Your shots of the Winslow House’s details are drop dead gorgeous! Especially the Sullivanesque ornament. Bravo! I finally got to see it when it was on tour this May & knew I’d forget the details, so now I have them to review again. Thank you so much. And bless you for your work here. Hi Mark, I watch in interest as the Penwern greenhouse is reconstructed. I own Waukesha Floral and Greenhouse and we had a vintage 1907 greenhouse built by Lord and Burnham. This is the Cadillac of greenhouse systems for the time. We still have the 1935 version of that greenhouse in operation. As I look at the pictures a few things come to mind. The pipes going into the ground may have been hot water heat. Greenhouses of this era heated in this fashion, especially rose houses. Sometimes, as in our case we had heat pipes underground in the floor beds and hanging from the underside of the greenhouse benches to get the heat near the crop. The wood struts for the roof may have been made of Cypress wood. Our greenhouse was all cypress wood because it holds up to high humidity and is opposed to rot. The struts were painted with a linseed oil based white paint. The struts would have been routed out to accept the sheets of glass that were laid in a bed of putty and then glaziers points were added to stabilize the pieces. The glass was laid up shingle style to overlap for water run off. Just a few observations. Penwern is one of my favorite Wright buildings. Thank you for adding to our understanding of the structure!